This is the second part of our interview with Aaron Seigo. Enjoy. Ikhaya: And if you think back to the times when you first had the idea of replacing the old Kicker: how many of your initial goals have been accomplished? Aaron: That's a hard question to answer because the initial goals were so small and tame compared to where we've ended up. I wasn't originally thinking about smart phones or media centers, or the ability to send live widgets zipping across the network between machines .. but that's what we've achieved. When it comes to allowing people build work flows, we're providing that with Activities; my goals for visual beauty have certainly been exceeded; the possibilities provided for an integrated widget system have similarly blown past my hopes. We still have a lot more work to do, but that's mostly because the ideas we started with have opened up so many new doors and avenues for us to explore. We're not finished yet, by any means, but I'm very satisfied with the idea that first set of goals have been met. Ikhaya: As we are a support channel we know that there are still some problems. Where do you see the biggest problems in KDE that have to be streamlined? But perhaps the biggest thing that needs attention is useful documentation. Userbase (http://userbase.kde.org) is a relatively new effort to open up the act of writing documentation to the broadest possible audience by using a wiki. It also emphasizes „how to..." type documentation over clinical descriptions of menu entries, for instance. Getting more people writing and contributing to that wiki will benefit all users of KDE software. After documentation, we still have a lot of work to do when it comes to the social/semantic desktop. It's new technology not just for us, but also in general: no other software product meant for use on end-user systems has ever attempted what we're doing with Nepomuk, Strigi, etc. So we're inventing new solutions to new problems as we go and learning a lot in the process. We probably still have a few years ahead of us before we really are taking full advantage of it. Kontact is also only now emerging in its fully updated version, using the new groupware system (Akonadi) and integrating with the rest of the platform. This effort has been years in the coming and has been extremely non-trivial to achieve, but the results are finally coming through. In the next few months we'll see the first major new release and with it improvements in performance and reliability. There is also lots to do in the Plasma workspaces as well, including things like improvements to the desktop effects infrastructure provided by KWin and standardizing the effects across window managers, both of which are happening. Improvements to Plasma Activities are ongoing and the new workspaces are coming along nicely, as well. Lots to do ... and that means all kinds of opportunities for those who would like to get involved in some way. The barrier to entry is very, very low and includes all kinds of useful tasks from writing documentation on the wiki to bug triage to contributing even the smallest of patches via reviewboard.kde.org that improves things. Ikhaya: Is there a feature from which you thought "this will never work" and then get surprised to the contrary? One feature set that really blew away my original assessment of it was the OpenGL driven desktop effects. It's non-trivial to do well, there aren't a lot of hackers drifting about who are great at OpenGL and at the time Compiz really had that niche cornered in Free software. We couldn't use Compiz, however, due to issues of stability, integration and the requirement to run in non-OpenGL environments, so despite the risks and daunting efforts, we had little choice to take it on. The results have been phenomenal, and these days Compiz and KWin developers routinely take inspiration from each other, and the effects offered by KWin are top notch. Many parts of the "environment window dressing" in Plasma Desktop, such as the full-screen widget dashboard or panel pop-outs, have benefited greatly from these effects. Perhaps the biggest surprise, however, has been the success of moving beyond the desktop form factor to tablet, netbook and smartphone. Most people I spoke to in the mobile arena, even in Free software, were highly sceptical that we could make that leap successfully. We'd have to rewrite our entire stack, some asserted. Others said that our user interfaces would need to be redesigned from the ground up. We chose to look at it in a newer way: as a device spectrum ranging from small screens with touch based interaction on up to workspaces with mice and keyboards. This is similar to how the Linux kernel developers chose to look at computers as a spectrum from embedded systems to supercomputers. With Plasma, we literally use the same code and many of the same UI components directly on all of these devices. That was supposed to be impossible, according to some, but we felt it was doable. How well it worked surprised all of us, though, I think. That the weather widget on my desktop works awesomely as a full screen weather app, or that the microblog desktop widget is perfect as a smartphone Twitter app .. the quality of that transition exceeded our expectations. Ikhaya: What are the prefered ways to contribute? Where is help needed? Aaron: The preferred way to contribute is openly and with joy. ☺ As for areas you can get involved, they are numerous and include: promotion, testing, bug triage, documentation writing, distribution liaison, system administration (we have a fairly large amount of infrastructure these days! ), artwork and, of course, software development. They all need attention, and we have nice communities of people around each topic. Pick what suits your skills and interests the most and dive on in. You can find us on irc.freenode.net in #kde-devel as well on the KDE mailing lists (http://www.kde.org/support/mailinglists/) and lots of helpful people on forum.kde.org as well. Ikhaya: How good is the quality of user-submitted bugreports? Aaron: It's pretty good and improving all the time. The improved crash reporting tool ("Dr. Konqi") in KDE Platform 4 is helping immensley by helping the reporter create much better reports. It can even download the debug symbols packages for you, install them, then regenerate the backtrace with more details .. all with one push of a button. It also looks for (and often finds) duplicate entries already in bugs.kde.org. So we've worked hard on the tools, and we're matching that with working with our user community on how to improve input and interaction on bugs.kde.org. Ikhaya: What are the most common mistakes? Ikhaya: Which is your favorite application in KDE? Ikhaya: Is there a cooperation with Canonical and if so, how well does it work? Aaron: There is. We've done technical previews of Plasma Netbook, for instance, with the Kubuntu team, and then continued to collaborate on the Kubuntu Netbook experience. App indicators are a result of working together as well, with Canonical adoption the Status Notifiers spec from KDE and building upon that in Gtk and GNOME applications. Canonical has also contributed back improvements to that technology, such as DBusMenu. Not only has this improved both KDE and GNOME software individually, but they work so much better together whent it comes to desktop shell integration. There are, as always, improvements yet to be made and new efficiencies to be found, but we're on the right track in my opinion with good communication, collaboration and fair treatment going on. Ikhaya: You held a keynote at this years KDE developer conference Akademy in Tampere, Finland and we heard some buzz about 'elegance'. Could you please explain what 'elegangce' mean? Aaron: Elegance is the attribute of being unusually effective and simple. It embodies a design sensibility as well as a level of usefulness into one concept. It's not enough to just be straight-forward or simple: it also has to be useful or effective. It's not enough to just be useful: it also has to be streamlined. Elegance comes in many forms and is broadly applicable to all acts of creation and design, and so I chose to emphasize it for the KDE community in my keynote. We can apply it to our application development APIs as well as to our user interfaces, so it's quite a universal concept. It's also a key concept because it can be approached with iterative improvements and has a huge impact on the enjoyability of a product. I believe that KDE software has a huge set of opportunities in the "Elegence department" ahead of it. Removing more jargon from our user interfaces, streamlining the configuration interfaces even further, finding new places to implement implicit metadata capture for the social/semantic desktop system ... these are all small things in and of themselves, perhaps, but they require a global attention to detail and implementation and combined are able to take KDE software to a whole new level. You'll be hearing more about this in the coming weeks as we are building some support systems for the pursuit of elegance in KDE. This is used by many of our downstream distributions and deployers to easily manage and control Plasma Desktop and Plasma Netbook presentation. Kubuntu is using it, for example, to define the default layout of the Plasma Desktop shell. Aaron: Freedom, fun and friends. I know for many KDE users out there it's just about software on their machine and is a fairly "cold" set of concepts, and that's fine. But for us who pour our creative energies and parts of our souls into it, it has become much more than that. It's hard to imagine something more rewarding. Kudos to martingr for contributing screenshots and helping translate this interview. Naja, der Mann scheint immerhin hochmotiviert zu sein. Aber ich komme nie auf den Geschmack. 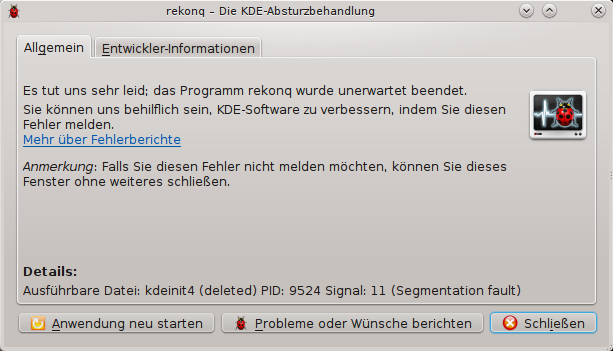 KDE ist irgendwie so ... uh. Auch beim Lesen des zweiten Teils habe ich das Gefühl, das Bonusmaterial einer 08/15-DVD anzuschauen, in dessen Doku sich alle gegenseitig auf die Schulter klopfen und ein "wir sind alle so lieb und es war die tollste Sache in meinem Leben und alles ist ja so toll" Gefühl erzeugen. Ein paar wenige Aussagen waren interessant, der Rest klang wie positives PR Gewäsch voller Zuckerwatte. Ich wünsche KDE das Beste, möge es irgendwann in naher Zukunft ein guter und schneller Usability-Desktop sein. Derzeit ist er dies bei mir auf meiner Hardware nicht. @3 und @5: Es mag ja sein, dass sich das alles so anhört wie Marketing-BlaBla und Selbstbeweihräucherung. Fakt ist aber, dass sich KDE in den letzten Jahren mit einer Dynamik weiterentwickelt hat, die erstaunlich, wenn nicht sogar sensationell zu nennen ist. Vor allem der Gedanke "Elegance" ist jetzt schon deutlich spürbar. Früher hätte ich gesagt: Bleibt mir weg mit KDE - das ist einfach zu grottenhässlich, mich interessieren die Vorzüge auch nicht mehr, wenn ich beim Betrachten des Desktops Augenkrebs kriege. Das hat sich entscheidend verbessert. Manches an der geschliffenen Wohlfühloptikt und -haptik von Gnome vermisse ich noch jeden Tag. Die Reibungspunkte werden aber von Monat zu Monat geringer und man merkt den Fortschritt deutlich. Ansonsten kann ich nur sagen, der ist ja mal wirklich motiviert, da sieht man förmlich die leuchtenden Augen, wenn man Ihn liest. Fast hätte er mich dazu bekommen, KDE doch mal wieder auszuprobieren.